We have got exciting news! Tamerlaine Farm Sanctuary has just purchased a stunning 336-acre farm which will be a new paradise for abused and neglected farm animals but we need your help to make this dream a reality! Tamerlaine Farm Animal Sanctuary is a not-for-profit organization dedicated to the rescue, rehabilitation and care of abused, neglected, and otherwise discarded farm animals. Established by Peter Nussbaum and Gabrielle Stubbert in 2013, Tamerlaine Farm was founded on the idea that rescuing animals from industrial agriculture and introducing them to the public is one of the most powerful ways to create positive change for billions of animals and the world in which we live. Currently, Tamerlaine Farm Sanctuary sits on a 40-acre property; but only a portion of the space is useable for housing animals. With the help of volunteers, we have expanded and improved the sanctuary with new fencing, barn building, field clearing and road building. This has allowed us to provide homes for a growing number of animals and consequently expand our educational programs. Parking at the sanctuary is limited and a sizable portion of our property consists of steep forest that is not suitable for animal enclosures. Stunningly, an incredible, once-in-a-lifetime property near our current facility came onto the market. 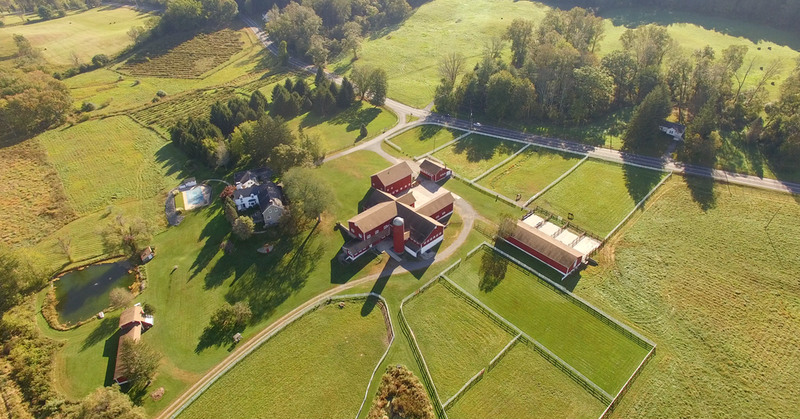 The property comprises 336 acres of pristine and preserved farmland equipped with beautifully maintained barns, stables, fenced in pastures, and hay fields. A charming colonial-era home which will be the future home of The Inn at Tamerlaine Farm overlooks the entire site. Although a huge financial undertaking, we felt that this was a once-in-a-lifetime opportunity for farm animals. While assuming ownership of this site and converting it to an animal sanctuary accelerates our expansion plans, with your help, we will be able to execute this undertaking and embrace it will all of our energy, passion, and determination. The number of lives, both human and animal, that can be transformed by Tamerlaine Farm Sanctuary in this new space dramatically surpasses what we can accomplish at our current facility. Join us in creating this incredible haven for future generations. We will be able to expand the amount of events and size of events at the farm. Our education center will become home to a beautiful, spacious art gallery and event space with the work of animal activist Jo-Anne McArthur, among others adorning the walls. We will open The Inn at Tamerlaine Farm within the first two years; in addition to housing visitors, we will host vegan cooking classes, weddings, corporate retreats, seminars and many activities geared to educate people about the many ways in how we can help animals. We will be a destination location for all schools in the tri-state area looking to increase their environmental studies and plan to reach out to lower income areas to introduce children to vegetable farming and plant based foods. With this new location we will create a sanctuary that will provide a secure and lasting legacy for generations to come. This new property offers great incredible potential for providing relief and new life to so many animals. Our firm belief that this move is in the best interests of our residents, our sanctuary, and our community prompts us to reach out and ask for the financial support we need to make it happen. Please join us in creating a sanctuary that is a paradise for animals and humans alike.